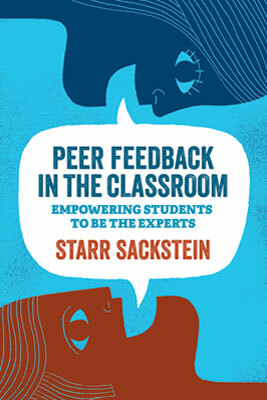 In Peer Feedback in the Classroom, National Board Certified Teacher Starr Sackstein explores the powerful role peer feedback can play in learning and teaching. Peer feedback gives students control over their learning, increases their engagement and self-awareness as learners, and frees up the teacher to provide targeted support where it's needed. Gain a deeper understanding of what meaningful feedback looks like and how it can be used as a tool for learning. Establish a respectful, student-led learning environment that supports risk taking and honest sharing. Teach students to be adept peer strategists who can pinpoint areas of needed growth and move forward with specific strategies for improvement. Develop cooperative student expert groups to help sustain effective peer feedback throughout the year. Use technology to enhance collaboration, streamline the learning and revision process, and strengthen students' digital citizenship skills. The book also includes extended reflections that express, in students' and teachers' own words, the approach's powerful effect on their practice. Invite students to be your partners in learning, and enrich your collective classroom experience. Premium and Select members who choose this Featured Selection get the print book. Premium Online and Select Online members get the e-book.